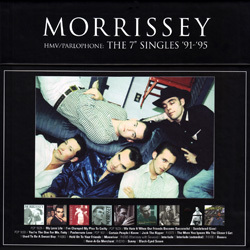 The box set contains nine 7" singles released by EMI in the UK between 1991 and 1995: "My Love Life", "We Hate It When Our Friends Become Successful", "You're The One For Me, Fatty", "Certain People I Know", "The More You Ignore Me, The Closer I Get", "Hold On To Your Friends", "Interlude", "Boxers" and "Sunny". Click on titles above for more information about the original releases and their respective artwork. Another box set of 7" singles, this one covering the years 1988-1991, was released the same day. 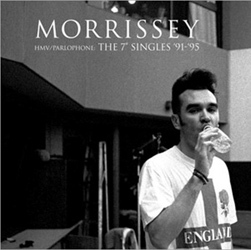 For more information, see "The 7" Singles '88-'91". Morrissey, photographed by Linder Sterling. A photo of the band appears on the back (view left).